The Scotland national football team represents Scotland in international football and is controlled by the Scottish Football Association. Scotland maintains its own national side that competes in the two major professional tournaments, the FIFA World Cup and the UEFA European Championship. Scotland is not a member of the International Olympic Committee and therefore the national team does not compete in the Olympic Games. The majority of Scotland's home matches are played at the national stadium, Hampden Park. 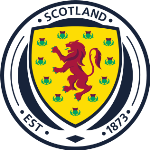 Scotland are the joint oldest national football team in the world, alongside England, whom they played in the world's first international football match in 1872. Scotland has a longstanding rivalry with England, whom they played annually from 1872 until 1989. The teams have met only five times since then, most recently in November 2014.